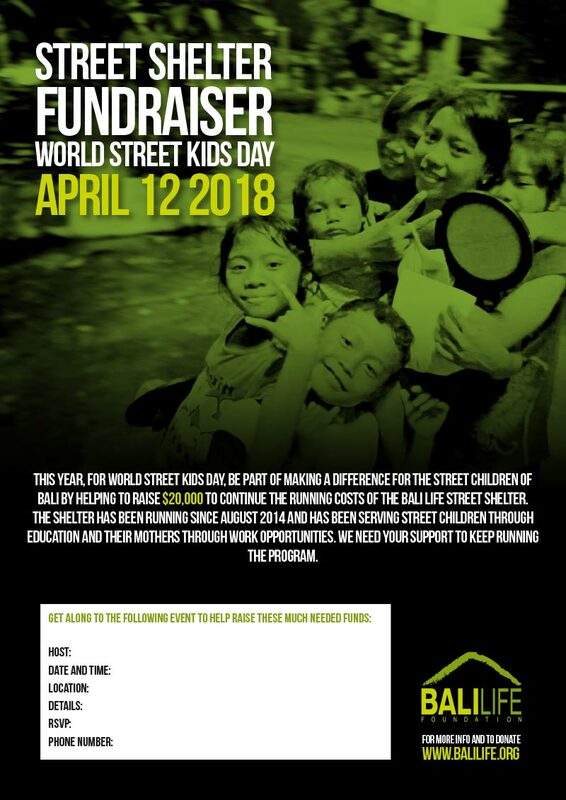 We are encouraging you to partner with us and run a fundraiser on or around April, which is the World Street Kids Day (12 April). The Event can be run on April. Be part of making a difference for the street children of Bali by helping us to raise $20,000 to continue the running costs of the Bali Life Street Centre. You can run a morning tea, a cake stall, a movie night or anything you can think of to help raise funds to keep this program running. 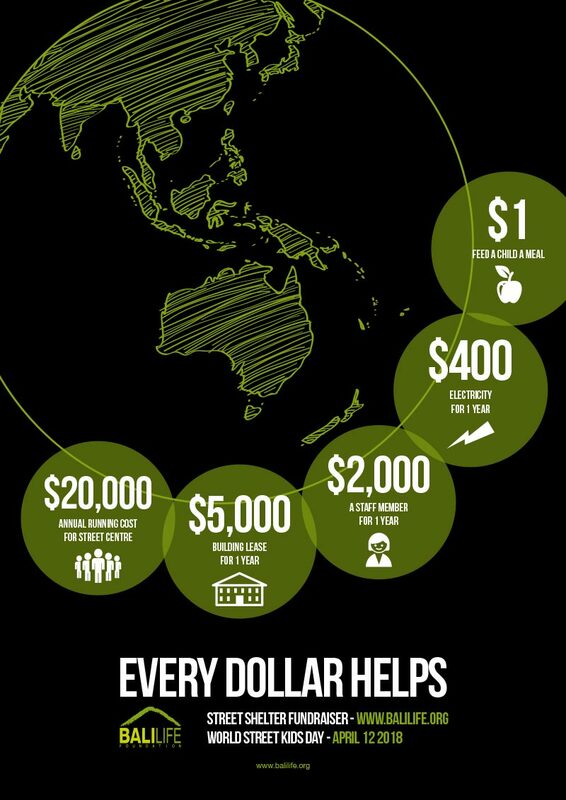 Please submit your fundraising results to info@balilife.org by May 30th at the latest. The shelter has been running since July 2014 and has been serving street children through education and their mums through work opportunities. We need your support to keep running the program. The Center is in Denpasar and looks to serve the street children and their families who would usually be begging on the streets. The center has two main programs; the Street Kids Informal School and the Bali Life Women’s Workshops/Centre for the mums. Every week our staffs and volunteer team heads to the streets of Kuta to meet with 60-80 children and their mothers to bring food and fun. These children leave their homes in the poor villages of Bali to move to slum areas in Denpasar to beg for money, selling bracelets, in order to live. We at Bali Life believe children should not be working under these conditions to support their families. For more information please visit our Street Kids Project page. We are encouraging people to run this in their homes, schools, uni’s, work places, community centres (church’s, sporting groups, social clubs), in a cafe or restaurant. Host a morning tea or something similar with the intention to raise money for our street program. This could be through charging an entry fee, door prizes or auction, casual clothes day or even a costume party. Make it a fun event for the people you choose to host. Make it clear how people can donate (online through pay pal, donation box, cash, bank transfer to our Bali Life accounts). For banking details please click here. When making a transfer please title it ‘street shelter’ and email us the transfer details. Use social media to let people know of your event. Speak with businesses in your local community for auction items and door prizes. Have a shared morning tea where everyone brings an item to share and you raise money through the event. You can use the posters provided below to promote the event. Print and give out our invites or email them as a calendar event. On the right hand side you will see some resources that you can print and use for your fundraiser. The video can also be downloaded through Vimeo and shown at your event or for promotion. Also check our media page for more videos for you to show. To register your event please email your details to: info@balilife.org so we know and can advertise what is happening to help this cause. Here’s a video that gives an overview to the Street Shelter which can you also use to promote your event.